Bricks were carefully stacked in the kiln, in such a way, that enabled the flames of the fire to pass through the brick stack & so 'burn' the bricks. When the kiln had been stacked, the fire openings were bricked off & sealed with wet clay, the kiln was fired up & left to cool slowly for a further three to four days, at which time the bricks were ready for use. Brick makers often prided themselves on the number that they could produce. “On Wednesday last, Joe Rush at Petersyke, Cumberland, performed the feat of making 1,000 bricks in an hour: 100 in five minutes: and 26 in one minute”. Carlisle Journal. Taken from Edward Dobson's “A Rudimentary Treatise on the manufacture of Bricks and Tiles”, 1850. 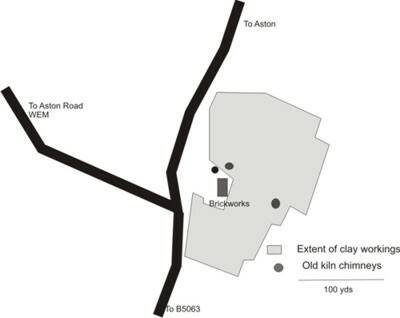 In the 1850 Burrows Industrial Directory there was the comment ‘Barker’s Green is in this (Aston) township and is noted for clay which makes a superior kind of bricks’ . When working, there was a chimney of more than 80 feet which has been demolished. 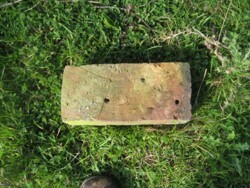 The kiln was built of firebrick, held together with a thick iron band. There were fireholes at regular intervals through which the burning coals were pushed, before being bricked up to allow the bricks to ‘fire’. 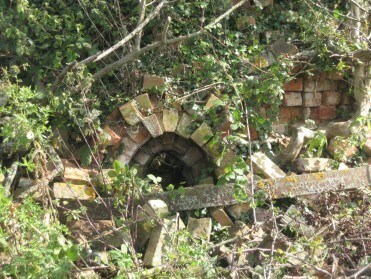 The brickworks were owned by William Ikin. In the 1920s, he sold the land to the Mainwairings. Roger Ashton of Aston recalls his father witnessing the deal in the middle of the village, where the pound notes for payment were counted out.